Today’s announcement by the Mayor of London, Boris Johnson, to encourage Londoners to replace their old, inefficient boilers with modern, energy-efficient models has been welcomed by the Builders Merchants’ Federation (BMF). 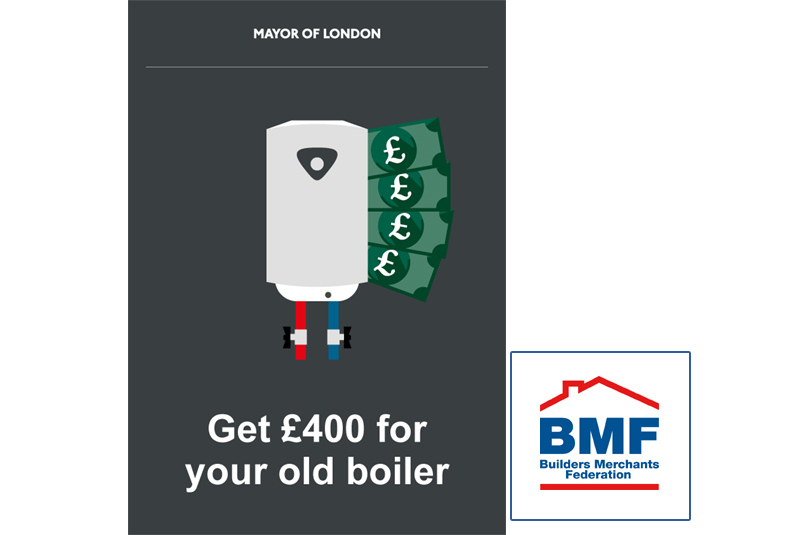 The Mayor launched his London Boiler Cashback Scheme to provide 6,500 owner-occupiers and private residential landlords with a £400 voucher if they replace a working 70% or less efficient boiler with a new 90% efficient or higher-rated boiler or low carbon heating system. Brett noted that in an ideal world, it would be better to have a coherent, fabric-first approach to improve the thermal and energy performance of homes and workplaces. But until the Bonfield Review is completed, BMF members are left in the dark as to what will replace the Green Deal. The BMF also wants to see this new scheme encourage people to have advanced heating controls, thermostatic radiator valves and magnetic filters installed at the same time. The London Boiler Cashback Scheme is a carbon-copy of the UK Government’s Boiler Scrappage Scheme introduced by the Labour Party in January 2010. Then, as now, the BMF was involved at an early stage to guide Whitehall in how best to design and implement that scheme. Many in the industry believe that its simplicity was the prime reason it was so successful in replacing over 118,000 old boilers and the BMF reports that the insight gained five years’ ago on how (and how not) to “formulate a scheme that works for everyone” helped to shape the arrangements announced today by the London Mayor. As far back as May 2009, the BMF has campaigned for an end-of-life scheme for boilers. During the Coalition Government, the BMF repeatedly asked Chris Huhne MP, Energy & Climate Change Secretary, and other ministers to re-introduce a further scheme.